Zermatt is a dashboard at the core of the Automature products, and includes the user interface for complete Agile Project Management and Test planning, scheduling, tracking and reporting, and the data warehouse. Support a workflow that allows users to plan regular, service-pack or patch releases and also supports the agile SW development model. Supports a workflow for building a hierarchical catalog of product features and requirements for each feature. For every change affecting the planning data, an audit log entry is provided, that can be filtered by data range, user, operation, or object modified. Supports a role-based permissioning model of either browsing or modifying planning and reporting data. Supports the cataloging of laboratory test resources that may play a direct or indirect role in the environment used to conduct specific tests. Supports the archival of various application-level log files generated during the test sessions. Supports the planning of test suites, test cases, test variables, test criteria in a well organized manner. Supports an almost unlimited number of low-performance impact ways to group or regroup test cases and test suites according to multiple arbitrary criteria, chosen by the user. These groupings can be as dynamic as needed. Supports a many-to-many cross referencing between product requirements and existing or planned test cases. Also supports the creation of new requirements based on existing test cases, or the creation or new test cases based on existing requirements. Supports a workflow for creating multiple test plans for a product, customized for the spcific purpose of a release or a sprint. Allows the test plan to contain specific test suites and test cases, and specify one or more test target environments. Supports, in addition to automated test data, the capture of manual test results at sufficient level of granularity, to allow process oversight and improvement. Supports a multitude of reports specifically targeted towards all levels of the company, such as developers, testers, QA management, product management and senior executives. Supports the analysis of various quality process metrics over time to allow discovery of trends. Supports drill down for most informational screens to navigate to the core, to aid post-mortem analysis of data. Supports the ability to import or export bulk data from or to XML format, to assist in quick capture of data, or use of external analysis tools. Supports the automatic generation of documents containing requiremenets, test plans etc.. that can be shared with interested stakeholders, using pre-defined template. Zermatt provides an ability to create a list of Backlog items, hierarchically grouped by Epics, Stories & Tasks, organized under a specific project or product. Zermatt provides an ability to create a list of virtual teams, created for the duration of a specific iteration (sprint), or multiple iterations. Zermatt provides an ability to assign a story to a team. Tasks within a story may be assigned to specific members of the team. Zermatt provides an ability to associate stories with points, integer values, that provide information about the importance of the feature/requirement to the business. Zermatt provides Dashboards at the Project, Release and Sprint levels, to show increasingly granular levels of information. Zermatt provides a two-level (features, detail requirements) ability to capture product requirements, by release and criticality. 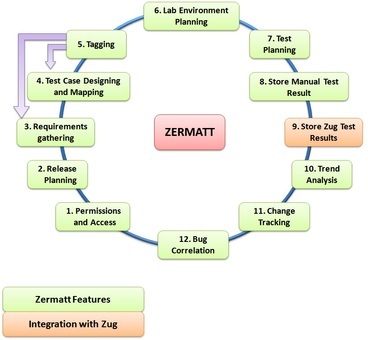 Zermatt facilitates the analysis of Requirements to efficiently discover and describe test cases, thus simplifying the test strategy planning process. Both Test cases, as well as requirements can be grouped in any number of arbitrary ways. A test Case may belong to multiple groups. Groups can be organized by any category. Zermatt facilitates the optimal choice of test cases and environments by providing multi-dimensional information regarding coverage, execution times, historic data, thus making the process of release test planning efficient, and targeted. Zermatt stores historic test execution information, which allows comparison between releases, sprints, projects over time. Zermatt can work with a bug tracking system to automatically correlate bugs to test cycles, and facilitate the automatic reporting, and verification of bug fixes. Zermatt's ability to store historic data about tests can be futher exploited using business analytics tools to provide valuable information about product quality. Access to browse or modify execution, planning data and reports is easily controlled through role-based permission groups. Zermatt supports the ability to link to a bug tracking system, so that a correlation can be provided between specific test execution history, and bugs encountered during that execution. This is designed to greatly enhance the verification of bugfixes, by providing automated cross-referencing capabilities..